The full title to this challenge is actually "I Can't Fall Asleep, Read Me a Bedtime Story Challenge." Tell us your favorite stories to read aloud. Tell us the stories that are better when you are listening to them. Go one step further --grab someone and read to them-- and tell us how it goes. We look forward to reading your comments --and adding to our book lists! Just try saying "Through three cheese trees three free fleas flew. While these fleas flew, freezy breeze blew. Freezy breeze made these three trees freeze. Freezy trees made these trees' cheese freeze. That's what made these three free fleas sneeze." This book keeps me awake. There are literally hundreds of wonderful bedtime stories I love to read aloud, but this one is a favorite b/c of the cutie-pies in my life. We've made our own poetic rendition and sometimes are known to have outbursts of "Chicka Chicka Boom Boom!" (in our eclectic, funkified rendition) whether we've got the book in hand or not. I love the part where all the letters fall out of the tree... for some reason when reading aloud, the cadence becomes very bluesy at this point. I couldn't pass up the opportunity to reflect on all of the times the little sweeties & I have read this one aloud... it touches my heart with its bittersweet message every single read and sometimes, we have tears. It is a story to read a life long... aloud is best. While we have scads of books, and love them, we have been developing an oral family tradition to go along with the book reading. One of our friends suggested telling a story, with the main character being your child's name spelled backwards. Usually this story retells the adventures we had during the day. Maybe someday it will be a book! I read this book a million times to my brother and sister when we were young and thanks to my Mom's incredible saving skills, I now am reading it to my kids. The "giraffe bending in half" and the "alligator's snout turning inside out" never cease to make my kids giggle. It is a fun read and the illustrations are so detailed. Even though we have at least three copies of this book (I think each of the kids has received one at some point or another) we don't even need them anymore because we have it memorized and just recite it aloud in unison. Then we all sigh contentedly after the last line, "Goodnight noises everywhere." Brown is a master at creating sentences for sleep. A stubborn boy and his sister meet a most unusual fairy godmother, who is tiny enough to sit on a daisy and who offers astonishing proof that this old world really is a magic place." The stories are simple and so endearing. Little Bear and his friends are sincere, caring, curious and very sweet. Something about the stories and illustrations feels very old-fashioned and comfortable. The language is simple and direct, and the stories often end with Mother Bear tucking Little Bear in to bed. A favorite in our home at bedtime. I LOVE this book just before i go to bed because the rythem makes me close my eyes and dream about wonderful things. There are three story books that come to my mind and heart. As a mommy, the Velveteen Rabbit by Margery Williams and Corduroy by Don Freeman and as a nana, Guess How Much I Love You by Sam McBratney. The illustrations are sweetly done. All are loving, warm, and cuddly just like bedtime! another favorite is Joseph Had a Little Overcoat by Simms Taback. the pictues and pattern never get old. I'm going to have to say Fantastic Mr. Fox by Roald Dahl. I could read that story a million times and never get tired of it. It's always been one of my favorites but reading it to my son (many times already, and many more to come I hope) has rekindled my love for this story. I like this book because it's amazing. It has lots and lots of different things. My favorite character is Mr. Fox because he gets all the food from everybody. The three farmers are not very nice at all. It's my mom's book. Lauren enjoys the Chronicles of Prydain at bedtime. Mama snuggles in bed with her and reads them. When asked why she likes them at bedtime she says she doesn't know: "I just like them!" Mama thinks it's partly because there's snuggling involved! In the Night Kitchen and Where the Wild Things Are by Maurice Sendak. 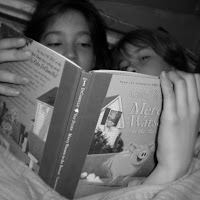 We loved to read all those books so much that we memorized them just so we could recite them and enjoy them when we didn't have the books with us. I only ever read aloud at story time and always select books about animals, which rhyme or allows for a lot of sound affects or suspense as pages turn. Lynley dodd writes great rhyming picture books starring animals with scarface claw being my favourite. I only listen to audio books in the car, definitely preferring those read by someone with a great accent. Faye kellerman's murder mysteries are narrated well and became very addicted to Julia Spencer-Flemings titles set in the adirondacks starring an episcoplian minister. Can pronounce those two terms now too. Would listen to anything stephen fry read and love a good Scottish, welsh or Irish accent. A great junior audio book was Cairo Jim by Geoffrey mcskimming, I think the word puns work much better when heard than read and I love talking animals!